Arguably the most impressive attacking player in qualification for this tournament, and possibly the best African player playing outside the big five leagues. Magisterial in gait, hefty and deceptively deft for a man of his size, the Tunisia skipper has delivered the sort of performances for club (FC Zurich) and country this season that now make observers understand Tunisians’ classification of him as a type of Zinedine Zidane de nos jours. Oozing effortlessness entangled with elegance, Chikhaoui’s instant control makes him the docking station that his team mates play off in, at times, pragmatic systems that commit few players forward and requires his attacking-midfield role to be carried out with utmost efficiency; from just the right amount running, to when to hold the ball, to when to lay it off, and so forth. Chikhaoui has carried out his job description with surgical precision. Experiencing respite from incessant injuries that have wrecked and derailed his career, it is safe to say the 28-year-old is back on track. He is bona-fide blockbuster material and if he performs to his ability, Tunisia progressing very far will be an inevitability. Prior to Afcon 2013 Kabore had largely been lumped him as the prototypical West African midfield bruiser and workhorse, but he left the tournament as a major case study of the debilitating effects of pigeon-holing players based on their ethnicity. Body-guarded by the gladiatorial midfield double pivot of Florent Rouamba and Djakaridja Kone, Kabora took care of himself and, most notably, unleashed a visionary side to his game that few knew he had, with the classy touches to execute sombreros and flicks. Indeed, going into the final against Nigeria, Kabore had completed 157 passes in opposition territory – the most by any player at the tournament. Despite all the evidence, though, the Kuban Krasnodar midfielder remains underappreciated. Structurally, he is even more important to Burkina Faso than Jonathan Pitroipa and Alain Traore. Without his robotic reliability and forward-thinking usage of the ball, the Stallions would seriously struggle. One year has passed since Nabil Bentaleb broke into Tottenham’s first team. He has since played in a World Cup, and become an integral part of Mauricio Pochettino’s first eleven. Cementing a position for the North London club is especially impressive, considering the options available in central midfield. Big money movers Benjamin Stambouli, Paulinho, and Moussa Dembele have all struggled for game time in wake of Bentaleb’s ascension. The 20 year-old midfielder is an efficient player, not a flashy one. He led all players at the World Cup in distance covered off the ball during the group stages. He also often tops the charts in passes completed and interceptions for his club or in the international arena. Christian Gourcuff’s 4-4-2 suits his manner of playing particularly well, as he is given the room to stretch his legs in both the offensive and defensive phases of play. The only major weakness in Bentaleb’s repertoire is that he can be overrun by stronger players. Algeria must remain strong in the middle of the park to contend with other Group C opponents. By far Zambia’s largest influence in midfield, Nathan Sinkala’s responsibilities have grown both on and off the pitch in these last six months. 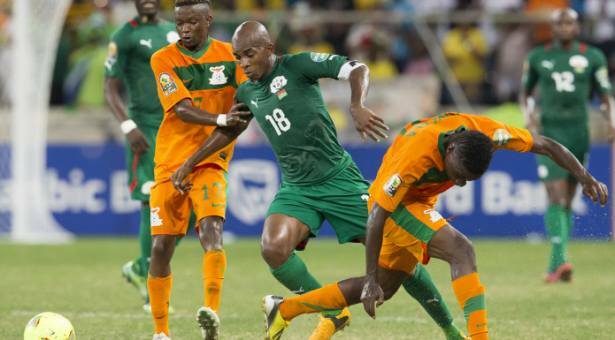 In the absence of shutdown defender Stoppila Sunzu, Sinkala donned the armband for Zambia on several succesful occasions. A word that best describes Sinkala’s style of play is, ‘industry’. The man on loan at Grasshoppers has stores of energy and his incredible work rate frees his teammates of some defensive constraints. Finding a proper partner for Sinkala in defensive midfield will be challenge for coach Honour Janza. Chisamba Lungu plays with elan, but may be lightweight for larger Tunisian and Congolese midfielders. Equatorial Guinea are yet to release a squad list, but when it is published later today, Juvenal is sure to feature. The 35 year-old central midfielder was Equatorial Guinea’s standout player in 2012, when the co-hosts managed three respectable performances. A very good passer of the ball, Juvenal no longer has the legs to cover the ground he used to, but his 28 caps are a team high, so his accrued experience will be vital. In addition to his metronomic passing, and intelligent defending, Juvenal dispatches Equatorial Guinea’s set pieces. The hosts won’t fashion scores of goalscoring opportunities so his contribution from dead balls is key. African pundits have long extolled the qualities of Didier Ndong at Tunisian club CS Sfaxien. In the four years Ndong played with Sfax, the Gabonese midfielder established a fruitful relationship alongside ‘El Artisto’ Ferjani Sassi. His primary responsibility was to sit in front of the back four and sweep up errant attacks. However, Ndong is a multi-faceted player, and with Gabon he plays in a more advanced position, showcasing his underappreciated creativity on the ball. The 22 year-old star finally managed a move to Europe early in the current transfer window when Lorient snatched him for the paltry sum of 1 million euros. There’s no doubting the shrewd acquisition, and Ndong will soon wow European audiences with Les Merlus. Babanco is one of several Cape Verdean players who left the archipelago at an early age to pursue their football in Portugal. After spells at Arouca, and Olhanense, Babanco seems settled in southwest Portugal at Estoril. Babanco is utility man, capable of playing up the left flank and in defensive midfield. With the Blue Sharks, he usually operates out of a double-pivot. Though he distributes well, he isn’t the largest player and therefore relies on his speed and bigger partner Toni Varela to compensate. Babanco can also dish dangerous crosses from the left flank in open play and from the right side from set pieces. West Bromwich Albion’s acquisition of Craig Gardner has curtailed playing time for Youssouf Mulumbu, but the 27 year-old midfielder remains DR Congo’s man in midfield. Mulumbu often captained the Leopards during the qualification campaign and, at 27 years of age, he is one of several leaders in Florent Ibenge’s team. Though he isn’t the most physically-endowed defensive midfielder, Mulumbu is extremely intelligent.With bruiser Distel Zola playing off of his shoulder in central midfield, Ibenge might ask for more of an offensive contribution from his captain who could produce more goals from midfield. A favourite of Volker Finke since he took over the national team, Eyong Enoh has become a constant in the Cameroon starting XI since the German took over, despite his domestic form swaying somewhat. After a variety of loan spells following Enoh falling out of favour at Ajax, he eventually signed for Standard Liege late on in the summer transfer window, and thus far has managed to get sent off twice in his first eleven matches – including a red card eleven minutes into his debut. Nevertheless, he remains a loyal servant to his country, going about his defensive midfield duties in a consistent if slightly uninspiring manner. A contrast to the positionally­ indisciplined ramblings of Alex Song, Enoh appeared in five out of the six qualifying matches for AFCON 2015, and will be a subtle component of any future success for the Indomitable Lions. Part of the African revolution that is occurring at Trabzonspor, Kevin Constant escaped Italian inter­club sharing system in the summer for Turkey, where he at last appears to be edging towards some consistent game time in his preferred position. Frequently deployed as a left­back during his time at Milan, the Guinean international now plays in the centre of midfield for both club and country, and is likely to play an important role in keeping his country in the tournament in Equatorial Guinea. Part of a double pivot with Boubacar Fofana, he will play an indispensable role in stemming the of the opposition attack – an even more vital role when you consider the colander­-like qualities of their inexperienced defence.